Alpha Phi Sigma, the nationally recognized honor society for undergraduate and graduate students in the criminal justice sciences. 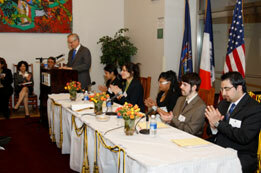 The honor society is open to undergraduates with a declared major in Correctional Studies, Computer Information Systems in Criminal Justice and Public Administration, Criminal Justice - Bachelor of Arts, Criminal Justice - Bachelor of Science, Criminal Justice Administration and Planning, Criminology, Deviant Behavior and Social Control, Forensic Science, International Criminal Justice, Judicial Studies, Legal Studies, Police Studies and Security Management. The honor society is open to those seeking graduate degrees in Criminal Justice (including Ph.D. program), Forensic Science, Forensic Computing, and Protection Management. 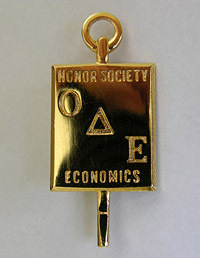 The newly established Omicron Delta Epsilon chapter at John Jay College, Beta Phi, recognizes scholastic excellence in economics. Eligible applicants must have completed 12 credits of economic classes taken at JJC (12 credits with an ECO prefix); a cumulative GPA of 3.0 or better; and a GPA of 3.0 or better in economics courses. Phi Eta Sigma - National Freshman Honor Society - Recruitment Drive Now Open! In 1999, John Jay College established a chapter of Phi Eta Sigma. As the oldest and largest national freshman honor society, Phi Eta Sigma encourages and rewards academic excellence among first-year students in institutions of higher learning. Membership is open to individuals who have earned GPAs of 3.5 or better during one or both semesters of their freshman year as full-time students at John Jay College. Students may join retroactively. Click here for an application. Fosters integrity and creative performance in the conduct of governmental and related public service operations. A chapter of Psi Chi was established at John Jay College of Criminal Justice in May 1974. Selection for membership is based upon the student’s academic record in psychology (with a minimum of 12 credits), as well as the overall class standing. Membership is open to undergraduate and graduate students, as well as to faculty members in the Department of Psychology. For more information please contact Prof. Demis Glasford in the Psychology Department at: dglasford@jjay.cuny.edu . Back in 2006-07, a handful of literature-loving English minors founded John Jay’s chapter of Sigma Tau Delta, an international English Honor Society. Now that we have an English major, we are hopeful that we can grow our membership in this honor society and take full advantage of its benefits. To become a member, candidates must have a minimum of two college courses in English language or literature beyond the usual requirements of first-year English composition. The candidate must have a minimum of a B or equivalent average in English. In general scholarship, he/she must rank at least in the highest thirty-five percent of his/her class, and must have completed at least three semesters or five quarters of college course work. There is a one-time $37 membership fee. For more information about Sigma Tau Delta, check out their website at: www.english.org. For more information about the John Jay chapter, contact Professor and Faculty Sponsor Professor John Staines at: jstaines@jjay.cuny.edu .